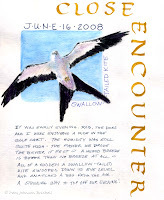 I saw my first Swallow-tailed Kite two summers ago. It was way up in the sky and of course, flying away from me. The tail was unmistakable, though. The S-t Kite's wings are long and slender, making it's job in nature (snatching large insects from the air and small lizards from trees) effortless. I had no idea it was so big. When comparing it's size with other raptors, I discovered it's larger than a Red-tailed hawk by a couple of inches in both length and wingspan! L 22", WS 51", Weight 15 oz. But, the Red-tailed Hawk weighs 2.4 lbs.! I love form and function in nature..... for everything there is a reason.